The classic dilemma in plastic product design still remains the same: Make it as light as possible, but also strong enough for the job. The thin walls in plastic containers, for example, must retain sufficient strength to hold the heavy liquid content without collapsing; therefore it requires balancing lightweight goals vs. structural requirements. And the issues related to plastic molding — warpage, flow consistency, and cooling behavior — still remain unchanged. But the technology to simulate plastic molding is evolving. Transparency — the way products look through the plastic skin — is now part of the simulation. With intense parallel computation, mold simulation algorithms are finding ways to run faster in a GPU (graphics processing unit) multicore architecture. Such developments don’t raise eyebrows, elicit exclamations and prompt enterprise restructuring the way subscription licensing, browser-based software and mobile apps have done. But for those who make a living in the plastic industry , these are meaningful steps that contribute to waste reduction, better-looking products and shorter development cycles. Belgium-based PolyFlow was first acquired by Fluent in 1996. When Fluent itself was acquired by ANSYS in 2006, Fluent’s technology assets, including PolyFlow, became part of ANSYS’s portfolio. 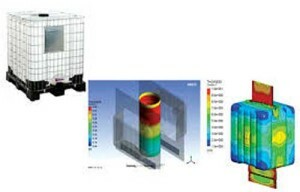 PolyFlow’s 25-year-old fluid dynamics technology for simulating polymer, glass and metals originated in university research labs, recalls Bernard Hocq, a senior project manager for ANSYS. “There’s a relationship between stretching and optical clarity. The non-isotropic stretching usually leads to optical defects that might make the consumer think there is something in the water, so you have to think of the acceptable stretching anisotropy as a constraint in the simulation,” explains Hocq. PolyFlow can help designers visualize not only the thickness distribution but also the stretching orientation and distribution which translate to optical quality. Though not one of the performance criteria, perfect clarity can affect the product’s success or failure. Transparency imperfection in a plastic container could make the crystal clear water within less appealing. “It’s difficult to put a number to perfect transparency, because it’s not really a performance attribute but a cosmetic issue,” Hocq notes. Hocq says PolyFlow’s solver offers higher accuracy compared to its competitors because of its complex viscoelastic models. PolyFlow solver is a direct solver — different from iterative solvers. “Our solver might take a little more time than an iterative solver, but it can also do much more than an iterative solver can do,” he explained. PolyFlow’s solver supports GPU acceleration. It uses the NVIDIA CUDA (compute unified device architecture) library. The program works faster on hardware with single or multiple Tesla GPUs, NVIDIA’s product line for high-performance computing (HPC). PTC Creo Parametric software comes with basic plastic analysis functions, including “3D thickness check to analyze your model’s geometry and fix basic issues,” the company states. The CMA Extension goes a step further. It lets you “quickly and accurately simulate the injection molding of plastic parts within PTC Creo Parametric … you can also perform such analyses as moldability, sink mark and weld line,” according to the company. 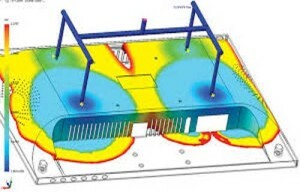 Software performance is often an issue with mold simulation. But the highly parallel computation involved is an opportunity for the GPU and clusters. Both PTC Creo Parametric and its companion CMA extension are GPU-accelerated. If a GPU is present, users will see an improvement in Creo Parametric’s anti-aliasing, lighting and enhanced shaded-with-edges display mode, Hsu explains. The extension also supports batch run and cloud computation. Today, Moldflow software remains the leading plastic analysis package in Autodesk’s portfolio. It’s offered as Moldflow Design, Moldflow Advisor and Moldflow Insights. Developed to test, modify and verify designs with real-time feedback, Moldflow Design is integrated with CAD packages. Moldflow Advisor helps identify defects, best injection location and simulation and design strategies. Moldflow Insight offers advanced features for in-depth injection studies, Polymer flow, mold cooling, part warpage prediction, model meshing and process parameter controls. Automotive, medical and consumer packaging industries rely on MuCell to create lightweight parts with high strength and stability. In Moldflow 2016, the product includes 3D analysis of MuCell making it easier to visualize what happens to parts with complex geometry in the process. In conducting mold and structural analysis, Moldflow takes into account detailed material information, including fiber direction and orientation. This is a useful feature for those working with manufactured fiber-filled plastics, whose strength and tension are influenced by the fiber layout. For complex jobs that require more processing power than what’s available in your own local machine or network, Moldflow offers the option to send the job to the cloud. The option is available for some of the most compute-intensive phases and operations of Moldflow, such as meshing, solving and design of experiments (DOE). The cost — the estimated number of cloud credits the job will consume — is displayed before the job begins. SOLIDWORKS Plastics comes in three different levels: Standard, Professional and Premium. The Standard version is fully integrated with the SOLIDWORKS CAD package, and can simulate the fill stage of cavity domain. Additional features to a single-cavity analysis are available in the Professional version including multi-cavity, family mold layouts, sprues, runners and the capability to simulate the Pack stage. The higher-end Premium version lets you simulate the cavity-to-mold heat transfer during the cooling stage, molded part deformation due to plastics warpage and more. Encouraged by advances in metal-based 3D printing, some automotive and aerospace manufacturers are currently exploring additive manufacturing’s (AM) potentials for mass-production of end-use parts. If the early initiatives prove successful, what used to be a prototyping and mockup building technology could become a full-scale industrial process. “The use of 3D printing to produce final parts is going mainstream among the manufacturing industry; this includes plastic or metallic parts. With the development of new materials, the notion of 3D printing the final product is more appealing to many companies. Another aspect of this is that several companies are 3D printing the mold to produce plastic parts,” says Jose Coronado, CAD product manager at PTC.